Pay tribute to those who serve! 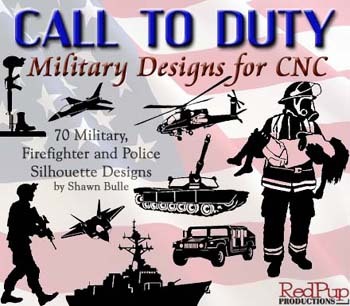 Call to Duty designs for CNC is a collection of 70 military, firefighter, EMS and police silhouette patterns. The patterns include A10, Abrams Tanks, Cobra helicopter, Apache helicopters, Huey, Blackhawk helicopter, Seahawk helicopter, Osprey, MLRS, HEMTT, Humvees, soldiers, submarine, destroyer, aricraft carrier, canons, drill sargeant, various military rifles, fighter jets, Corsair, SEAL buggy, Coast Guard boat, Predator Drone, APC's, C-130 cargo planes, Bradley Fighting Vehicle, fallen soldier memorial, firefighters, police, ambulance, firetruck, etc. This disc also includes the star of life and firefighters maltese cross designed to be cut on your CNC table. The majority of this CNC art disc contains military aircraft, vehicles, weapons and soldiers. 14 of the patterns are firefighting, law enforcement and EMS (pictured below).